From the Mint of Poland (Mennica Polska) with a first debut in October 2015, the theme of the series is the north-eastern Italian city of Venice. Highly unusual, Venice is sited on a group of 117 small islands set in the marshy Venetian Lagoon between the mouths of two rivers. It’s connected together by numerous bridges spanning the canals that divide the islands. Because of the nature of the ground under Venice, the building foundations are based on closely-spaced timber piles of Alder wood driven into the sand and mud until they reach a harder layer of compressed clay. On top of the piles are plates of Istrian limestone, upon which sit the buildings of brick or stone. In spite of being installed centuries ago, the timber piles are mostly still intact as wood does not decay quickly when submerged in oxygen-poor conditions. In the 20th century, many artesian wells were sunk into the lagoon periphery to supply water to local industry, but soon after Venice began to subside. Artesian wells were banned in the 1960’s and although subsidence has slowed to 1-2mm per year, it does continue. The city is subject to repeated low-level flooding, called Aqua Alta where much of the city is submerged under several centimeters of water. There are currently engineering projects under way to help alleviate the problem by blocking the incoming water from the Adriatic Sea. The lagoon and a part of the city are listed as a World Heritage Site. While the mints description of the series reproduced below is a little melodramatic, there’s no doubt that the city is home to some very impressive architecture and art. A major maritime and trading power for much of its history, the wealth that generated was displayed for all to see, especially during the Renaissance period. The object of this series is to showcase some of the most well known in two ways. Each coins reverse face depicts a cleanly struck representation of a famous piece of Venetian art or culture in one area. 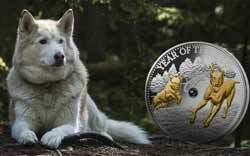 On the rest of the coin is reproduced a famous painting that is linked to it. Unlike the poor, low-resolution colour that is often applied to many coins, the Mint of Poland uses high-resolution digital printing, and the difference in quality is quite apparent. It’s a similar technique to that used for their Stunning Galaxies series of astronomy coins, one that disappointed for the lack of difference between each new coin, rather than the quality of them. Each coin has a good level of relief, explaining the smaller than usual 32mm diameter for a 31.1 g coin instead of the more standard 38-40mm. Two versions of each design are available. 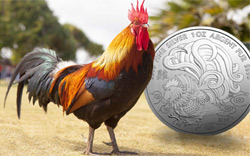 Firstly, the usual one ounce fine silver coin, this having a mintage of 777 units. Secondly, a 0.9999 gold coin of an unusual 10g in weight, and with an incrediblly low mintage of just 40 pieces. The downside to the low gold mintage is a higher than usual price, currently hovering around the €1,000 mark. 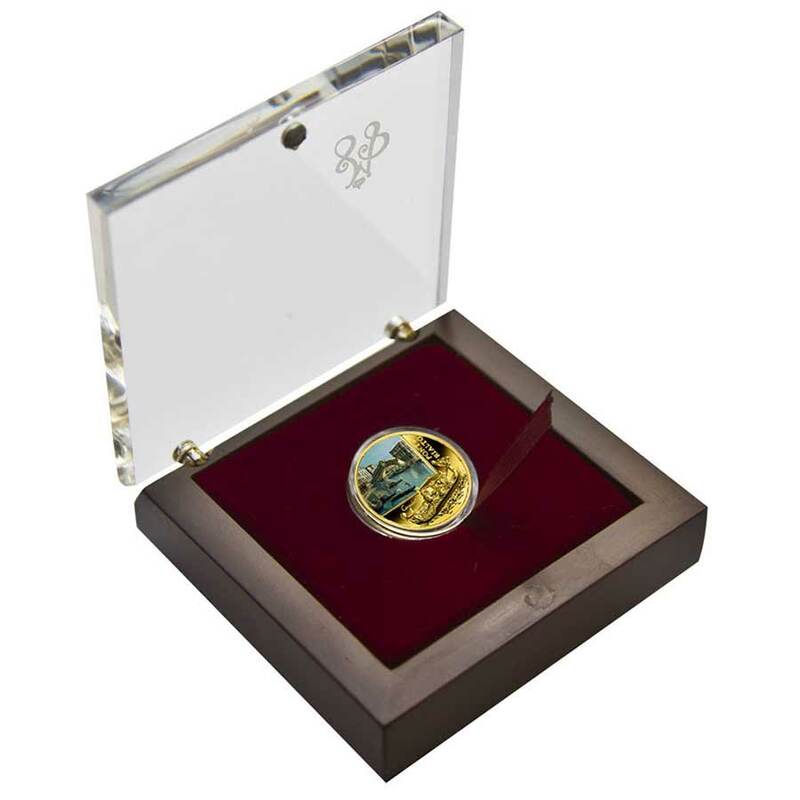 Packaging of the gold is very nicely realised, the acrylic lid on the wooden boxed being etched and allowing a good look at the coin. 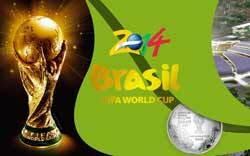 The silver is in the standard coin box used by the Mint of Poland for most of its silver coins, a decent affair. 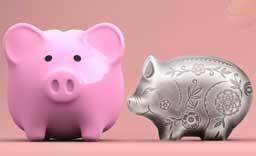 At the time of writing the silver was around the €100 mark. Only the first silver coin, Doge’s Palace, is dated 2015; all subsequent coins are dated 2016 or 2017 but share an identical obverse design. Images of each coin and the mints description of them are below. A classically designed series that should have appeal to art fans, and one that does a good job with colour on gold for a change. The impressive architecture of the city has always been a source of inspiration for the great Italian painters. Our coin “Doge’s Palace”, opening the series “SOS. Venice – End or Beginning?”, features Canaletto’s famous painting “Return of the Bucintoro to the Molo on Ascension Day”. 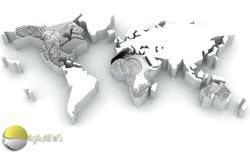 Its reproduction, vividly reflected on the reverse of the coin thanks to high-end digital printing, depicts a historic seat of the city rulers. The Doge’s Palace is a splendid example of the Venetian Gothic architecture, formed under the influence of Byzantine and Moorish styles. The images of a winged lion and a kneeling doge from its façade were meticulously etched onto the coin’s reverse. This elegant relief frame complements the work of art by Canaletto. REVERSE: The reverse depicts a fragment of Canaletto’s painting “Return of the Bucintoro to the Molo on Ascension Day”. 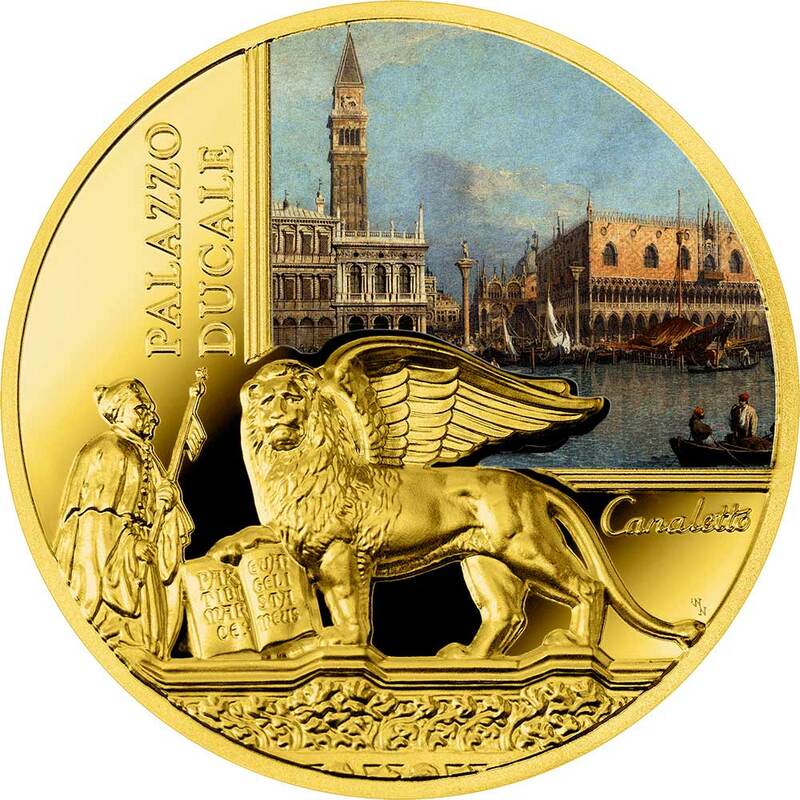 In the bottom part of the coin – images of a winged lion and a kneeling doge derived from Porta della Carta (main entrance to the Doge’s Palace). Along the painting’s frame, vertically – inscription: PALAZZO DUCALE (name of the coin in Italian). Along the painting’s frame, horizontally – stylized inscription of the painter: Canaletto. The impressive architecture of the city has always been a source of inspiration for the great Italian painters. 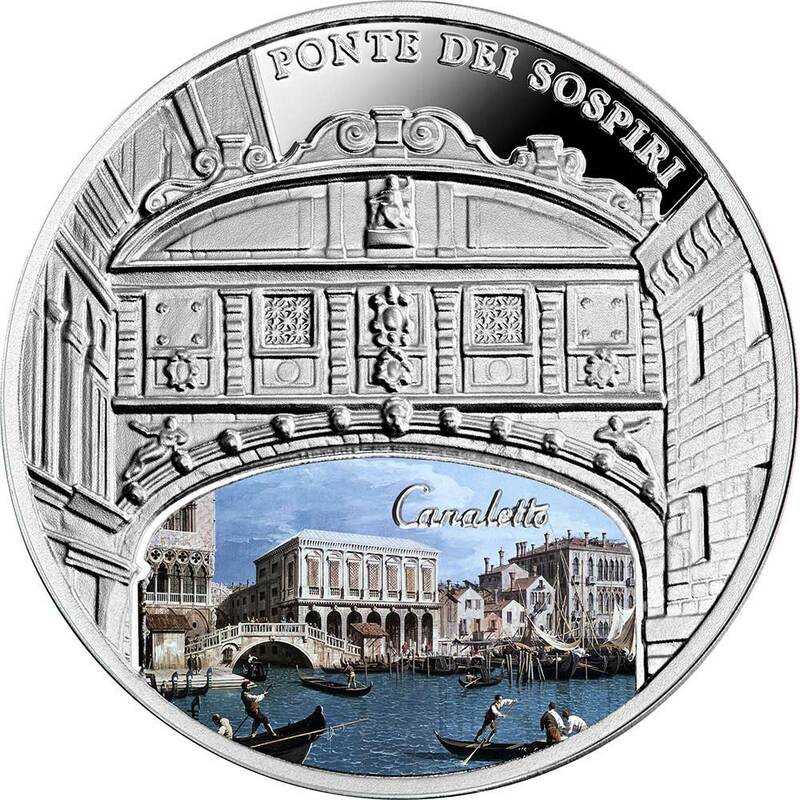 Our coin “Ponte di Rialto” from the series “SOS. Venice – End or Beginning?”, features Canaletto’s famous painting “The Grand Canal Near the Ponte di Rialto”. 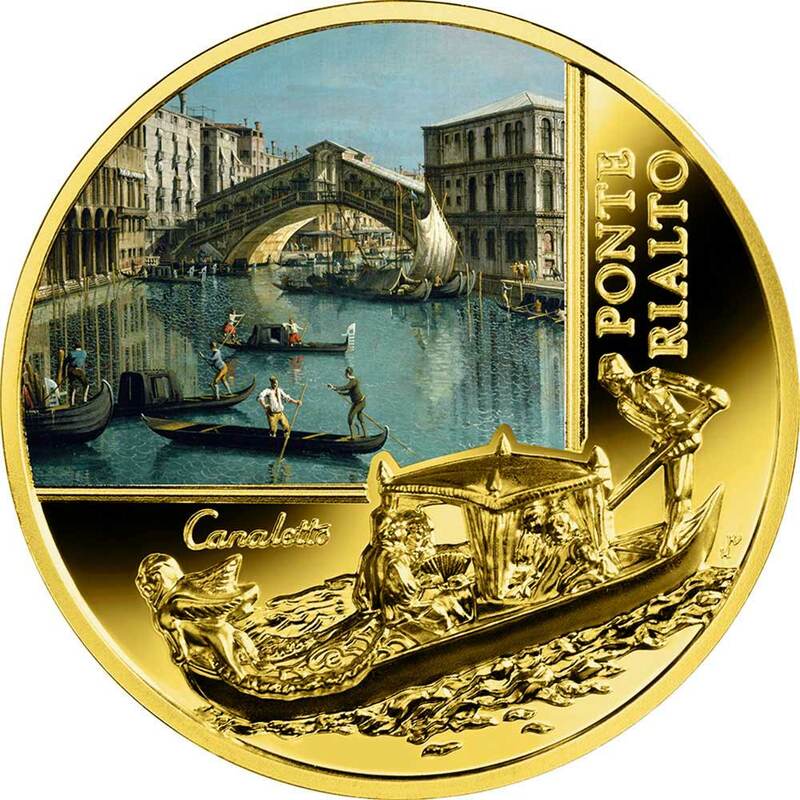 Its reproduction, vividly reflected on the reverse of the coin thanks to high-end digital printing, depicts a romantic view over the Rialto Bridge. Like a rainbow arching over the water, the bridge connects the banks of the picturesque strait. Arcades lined on both sides of the walkway create an impression that the bridge is literally hovering above the glittering waters of the Grand Canal. Imagining Venice without its gondolas is hardly possible. One of them was meticulously etched onto the coin’s reverse. This elegant relief frame complements the work of art by Canaletto. 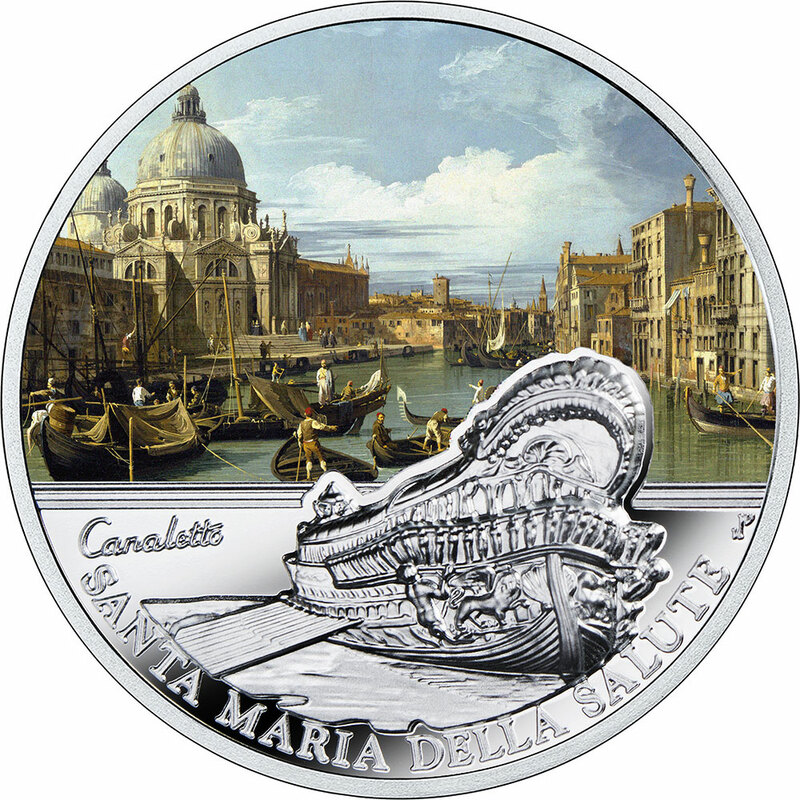 REVERSE: The reverse depicts a fragment of Canaletto’s painting “The Grand Canal Near the Ponte di Rialto” (digital printing). In the bottom part of the coin – relief image of a gondola. Along the painting’s frame, vertically – name of the coin in Italian: PONTE RIALTO. Along the painting’s frame, horizontally – stylized inscription of the painter: Canaletto. The impressive architecture of the city has always been a source of inspiration for the great Italian painters. The third coin from the series “S.O.S. Venice – End or Beginning?” features the famous painting by Francesco Guardi. In 2014, the impressive cityscape was sold at an auction for a record price of £10 million. 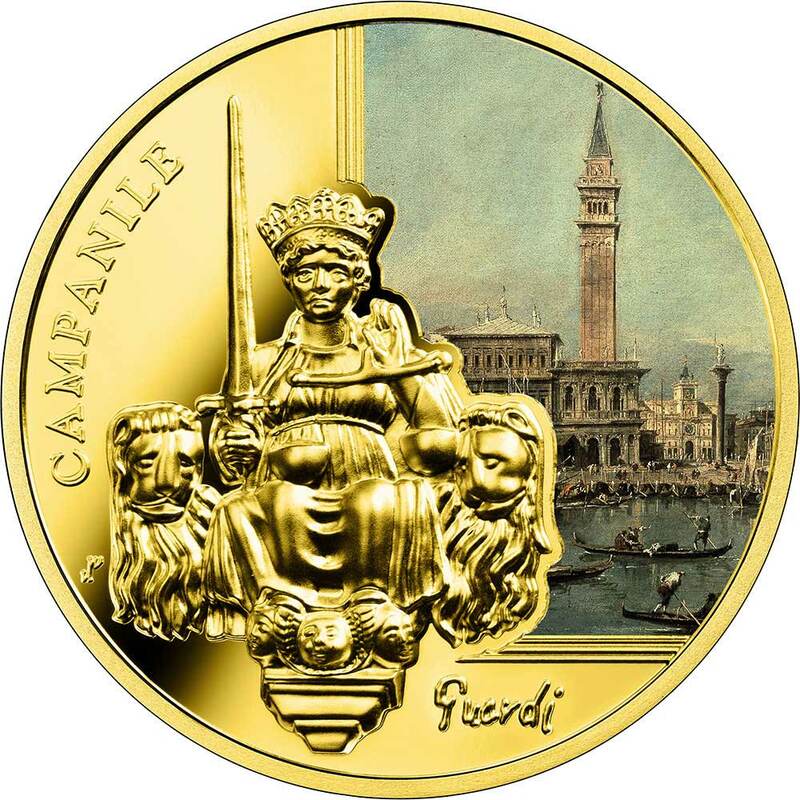 Its reproduction, vividly reflected on the reverse of the coin with the use of the high-end digital printing, depicts a panoramic view over the St Mark’s Campanile. Towering over the gothic architecture of the city, the bell tower remains the tallest building and, simultaneously, one of the most commanding landmarks of Venice. The campanile is decorated with intricate bas-reliefs – one of them was meticulously etched onto the coin’s reverse. This elegant composition perfectly enrames the work of art by Francesco Guardi. The impressive architecture of the city has always been a source of inspiration for the great Italian painters. The fourth coin from the series “S.O.S. Venice – End or Beginning?” features the famous painting by Francesco Guardi. One of his chefs-d’oeuvre depicts the St Mark’s Square with a view over a medieval basilica, a bell tower, the arcades of the Procuratie Vecchie and the Procuratie Nuove, as well as numerous stalls and cafés. 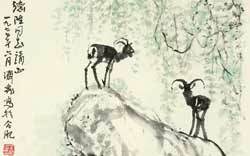 The painting perfectly captures the atmosphere of the bygone era. In the XVIII-century Venice the exquisite gowns of the city dwellers – fancy dresses of the ladies and scarlet capes of the men – constituted an integral part of the beautiful Venetian landscape. The painting’s reproduction was vividly reflected on the coin’s surface with the use of high-end digital printing. The right-hand side of the reverse depicts St Mark’s winged lion derived from one of two columns devoted to patrons of Venice – St. Mark and St Theodore. This elegant high-relief frame perfectly complements the work art by Francesco Guardi. REVERSE: Right-hand – St Mark’s winged lion derived from one of two columns carrying the symbols of two patrons of Venice (high relief). In the upper part of the reverse, left-hand – fragment of a painting by Francesco Guardi (digital printing). 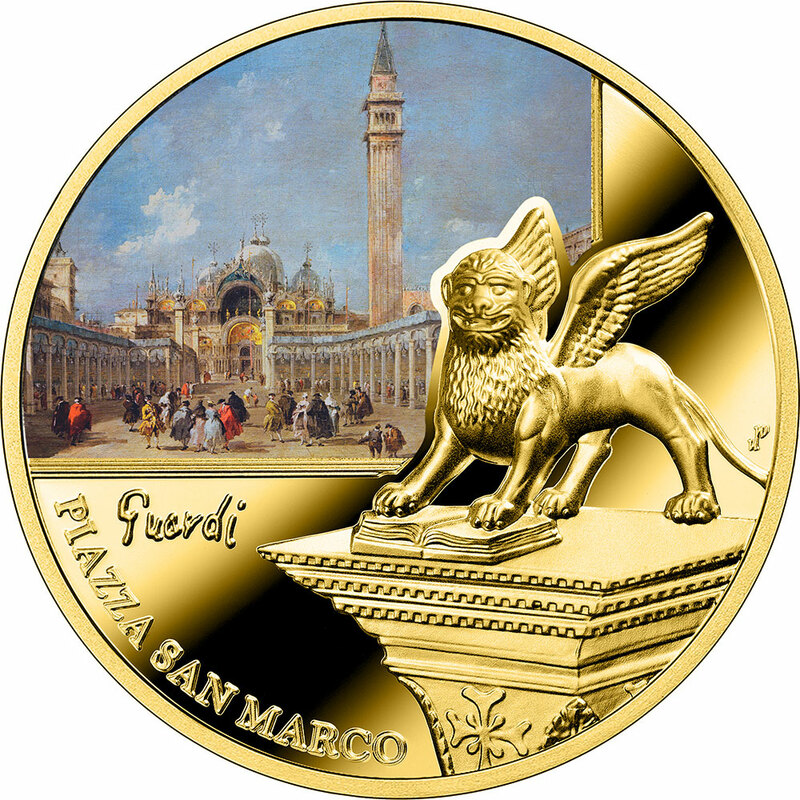 Along the rim, left-hand –name of the coin in Italian: PIAZZA SAN MARCO. REVERSE: In the upper part of the reverse – fragment of a painting by Canaletto (digital printing). In the bottom part – Bucentaur, the legendary state barge of the doges of Venice (high relief). Along the painting’s frame, horizontally – stylized inscription of the painter: Canaletto. 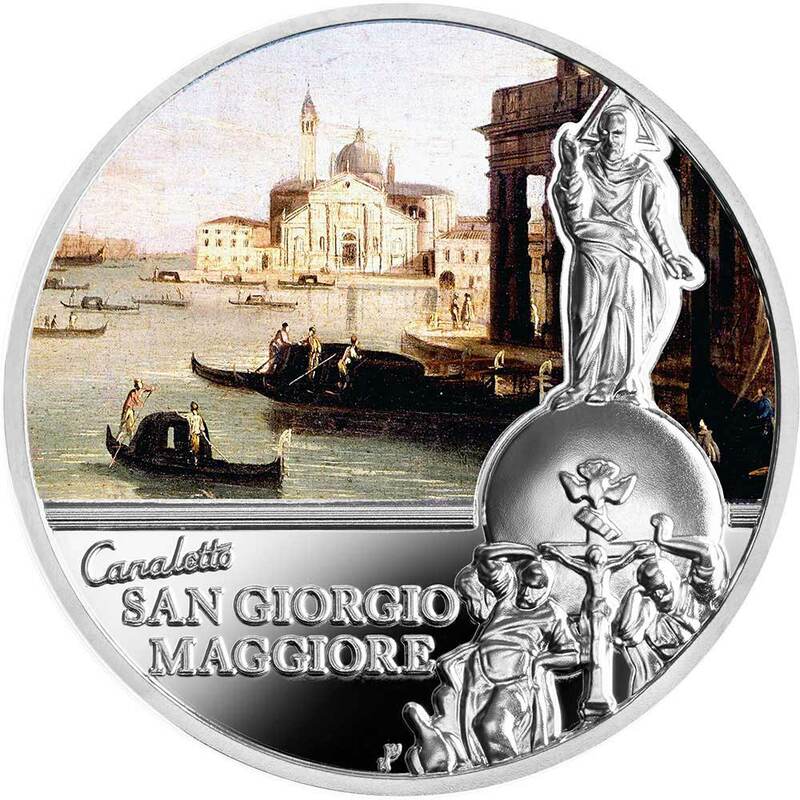 Along the rim – name of the coin in Italian: SANTA MARIA DELLA SALUTE. The sixth coin from the series “S.O.S. Venice – End or Beginning?” features the famous painting by Canaletto. One of his chefs-d’oeuvre depicts the Santi Giovanni e Paolo square with Gothic Franciscan basilica of the same name and Renaissance façade of Scuola Grande di San Marco looming in the background. 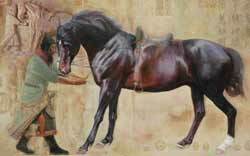 The painting’s reproduction has been vividly reflected on the coin’s surface with the use of high-end digital printing. The bottom part of the reverse depicts the statue of condottiere Bartolomeo Colleoni cast by Andrea del Verrocchioю The effigy of the proud horseman restraining his magnificent stallion is one of the most famous equestrian sculptures in the world. This elegant high-relief frame perfectly complements the work art by Canaletto. REVERSE: In the upper part of the reverse – fragment of a painting by Canaletto (digital printing). In the bottom part – statue of condottiere Bartolomeo Colleoni cast by Andrea del Verrocchio (high relief). Along the painting’s frame, vertically – stylized inscription of the painter: Canaletto. 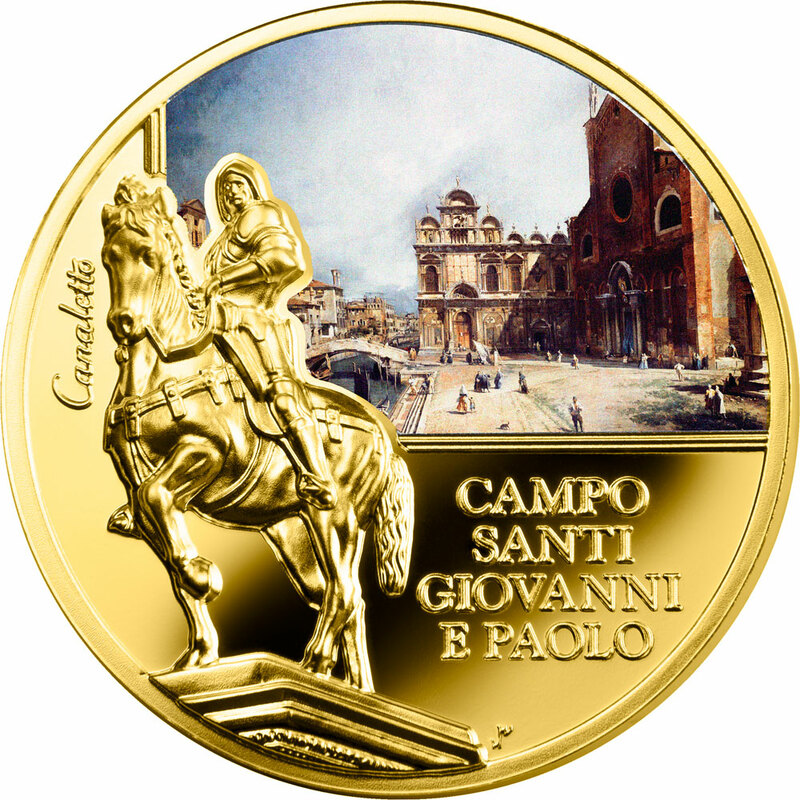 Along the rim – name of the coin in Italian: CAMPO/SANTI/GIOVANNI/E PAOLO. The seventh coin from the series “S.O.S. Venice – End or Beginning?” features the Bridge of Sighs, one of most famous landmarks of Venice. Although today couples kiss under its arch while drifting along the Rio di Palazzo canal, the history behind the bridge is not as sentimental as its poetic name would indicate. built in 1614, Ponte dei Sospiri links the Doge’s Palace to the building of the New Prisons. A legend coined by Romantic poets says that the bridge has got its name from the sighs exhaled by the prisoners crossing it, as they caught their last glimpse of beautiful Venice through the stone-barred windows. Featured in high relief, the image of the bridge frames the cityscape by Canaletto imprinted on the coin’s surface with the use of high-end digital printing. REVERSE: In the upper part of the reverse – Bridge of Sighs (high relief). In the bottom part – fragment of a cityscape by Canaletto (digital printing), stylized inscription of the painter: Canaletto. Along the rim – name of the coin in Italian: PONTE DEI SOSPIRI. Venice has always been a source of inspiration for great Italian painters. Eighth commemorative coin from the “SOS” series. Venice – the beginning or the end? “Represents the renaissance Renaissance Basilica of San Giorgio Maggiore in the 16th century. Its snow-white marble facade shines in the sun, attracting the eyes of passersby from every corner of the lively waterfront Riva degli Schiavoni . Inside the basilica is a magnificent altar representing the God Father standing on a gilded globe supported by four evangelists. The sculpture was reproduced on a coin with a high relief . 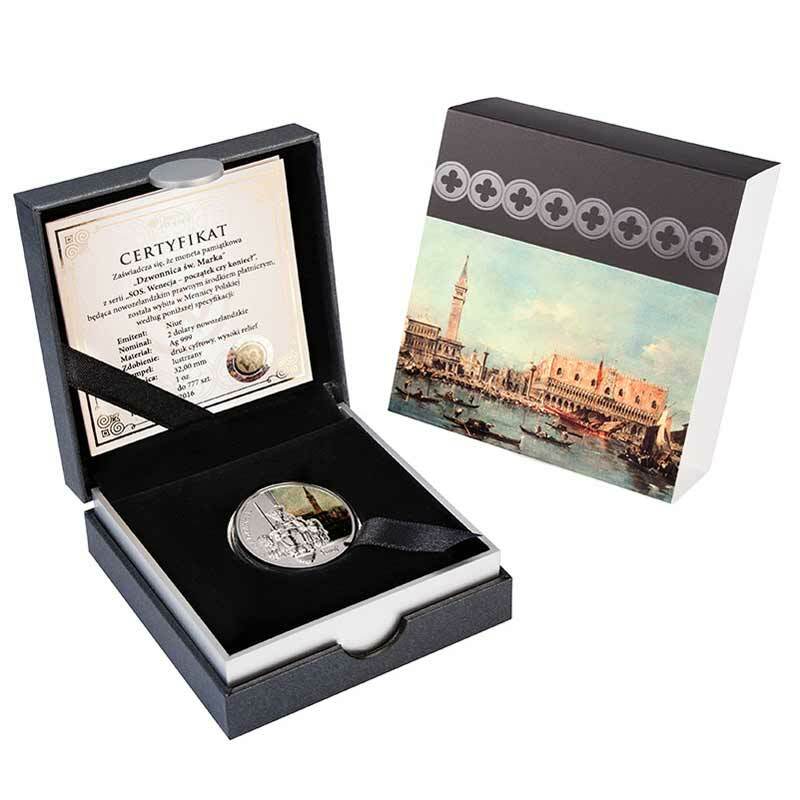 In this way, the reproduction of the Canaletto image , deposited on a coin by means of the highest quality digital printing , has been inscribed in an elegant composition frame. REVERSE: In the lower and left part of the reverse – Altar from the basilica (high relief). In the bottom part – fragment of a cityscape by Canaletto (digital printing), stylized inscription of the painter: Canaletto. 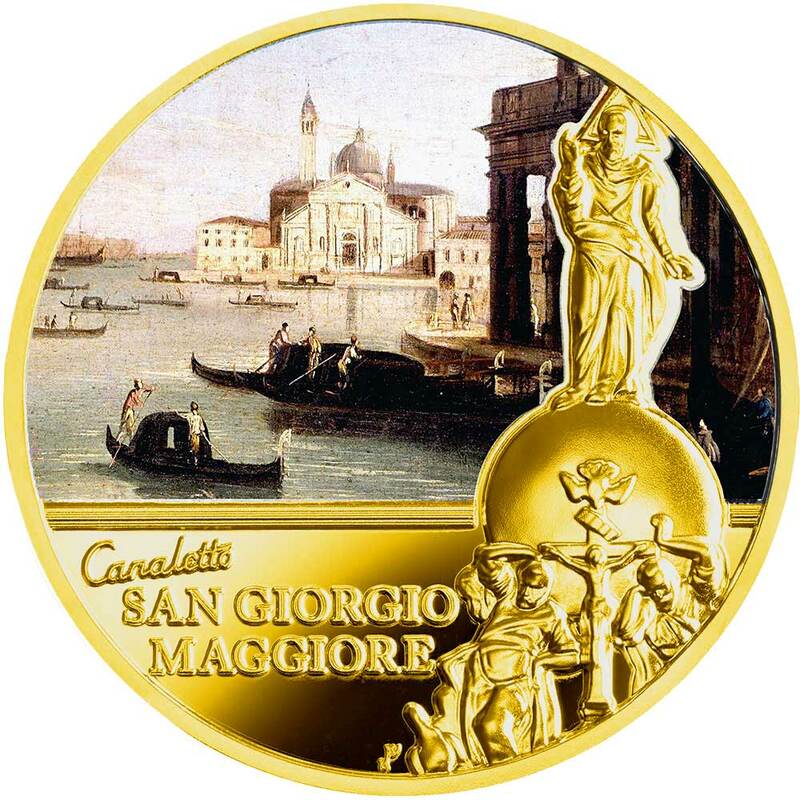 At the bottom – name of the coin in Italian: SAN GIORGIO MAGGIORE. Will Venice disappear without trace like Pompeii and legendary Atlantis? Will the tremendous forces of nature take over the impressive architecture of the city? There are numerous indications that Venice will soon disappear in the sea depths. The city is threatened not only by rising sea levels, but also by gradual landslides caused by the movement of tectonic plates. 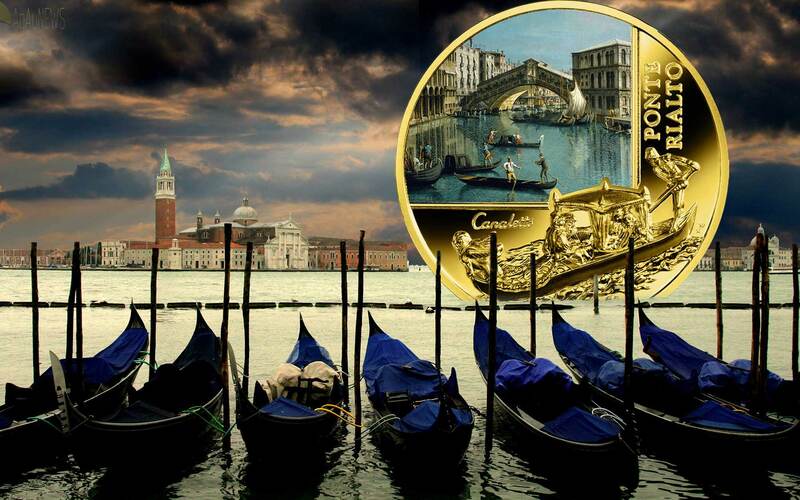 The Mint of Poland, concerned about the future of Venice and inspired by its fragile beauty, commemorated its distinctive landmarks in fine gold and silver. AU OBVERSE: In the central part of the coin – effigy of Her Majesty Queen Elizabeth II. Below – inscriptions: Au 999.9 (hallmark), m/w (mint mark). 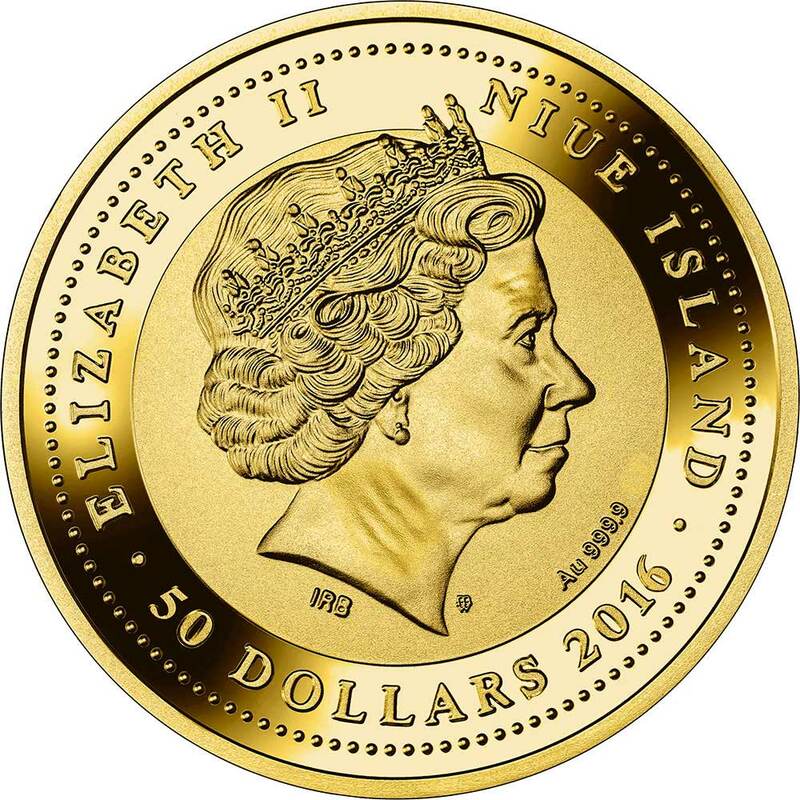 Along the rim – inscriptions: ELIZABETH II, NIUE ISLAND (issuer), 50 DOLLARS (face value), 2016 (year of issue). AG OBVERSE: In the central part of the coin – effigy of Her Majesty Queen Elizabeth II. Below – inscriptions: Ag 999 (hallmark), m/w (mint mark). 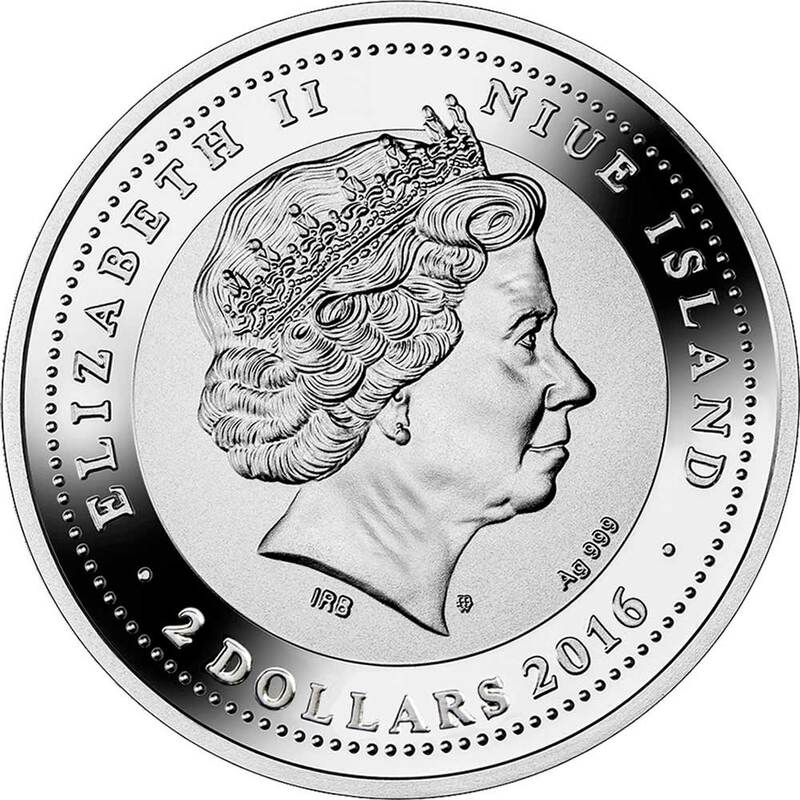 Along the rim – inscriptions: ELIZABETH II, NIUE ISLAND (issuer), 2 DOLLARS (face value), 2016 (year of issue).